About the Hopi High group we have several students in the radio class who are still working on their pieces and when they finish their pieces we'll put them up to be heard all over the country. Our teacher is Stan Bindell or "Paparazzi" because at any event he has a camera with all the time. The Hopi High radio class performers the live remote weekly show, the Hopi High Teen show every Thursday on Hopi Radio station KUYI. The Hopi students interview other students, Teachers, coaches, administrators and community members. 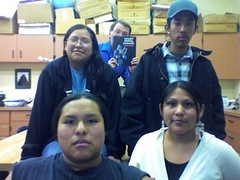 The Hopi High students also call in news briefs to KINO radio station in Winslow, AZ. The Hopi High radio class has been very successful, receiving awards from the Arizona Interscholastic Press Association with a total of 18 awards in the past summer and spring. Two students, Povi Lomayaoma and Paul Quamahongnewa had received scholarships to attend the National Federation of Community Boadcasters conference in Atlanta, Georgia.